The centre has horses that are suitable for children, and family groups are welcome. A visit to Transylvania will open young peoples’ eyes to a traditional way of life, with sights such as free-ranging farm animals and horse-drawn transport that they won’t see in the West. Trail rides are suitable for mature children as young as 10 years, provided that they can control a quiet horse in a group in open spaces at varying speeds. We do require that, on our riding trips, parents take an active role in supervising their children at all times. 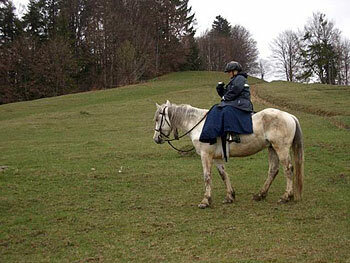 One of the centre’s highly-versatile horses being ridden side saddle on a five-day trail ride. Stefan cel Mare strives to meet the needs of each individual. Visitors receive assistance in mounting and dismounting from centre staff when necessary, and a mounting block is available at overnight stops. The centre has horses that can be ridden side saddle and has received riders who have needed to ride in that style owing to physical handicap. Accompanying non-riders generally travel by horse-drawn vehicle, so they need to be able to hang on tightly when the vehicle negotiates occasional rough ground. The driver will assist passengers in entering and exiting the vehicle. In general, ground floor accommodation is available at each overnight stop; however, there will be some steps to negotiate in almost every building.